In The Departed, Martin Scorsese’s hyper-violent remake of the Honk Kong crime classic Infernal Affairs, everybody has secrets, agendas, and a willingness to pull the trigger. And underneath their carefully composed disguises, all of them are devoted to the service of somebody-either a criminal, a cop, the cause of justice, their family’s honor, or their own selfish hearts. And God? Well, one of the villains served as an altar boy, but he’s left faith far behind. And it’s easy to see why: there’s little evidence of God in these streets. Does the Almighty even care about the plight of the righteous man in this town anymore? The question remains unspoken, almost cynical. As Scorsese explores the mean streets of South Boston, he doesn’t find much in the way of spiritual inquiry. Instead, he finds the cops at war with an organized crime operation run by ruthless Irish-American thugs. And the farther he takes us into this conflict, the more we realize that both sides are thoroughly corrupt. Undercover operative Billy Costigan (Leonardo DiCaprio) is struggling to maintain his integrity as he works his way into the inner circle of crime kingpin Frank Costello (Jack Nicholson). He comes from a family with a sin-smudged history, and he wants to be the exception. But the closer he gets, the more he must involve himself in reprehensible deeds, and his hopes of redemption grow bleaker with every step. Meanwhile, one of Costello’s fellow conspirators, Colin Sullivan (Matt Damon) has crept up in the ranks of the Boston police to become a prominent investigator. And once he’s there, he’s cocky enough to wrestle with old-timers like Captain Ellerby of the Special Investigation Unit (Alec Baldwin, in a role that’s almost self-parody). It’s hard to find someone worthy of our admiration or sympathy in this fight. Attack a bad guy, and he might turn out to be an undercover cop. Trust a good guy, he might turn out to be a villain. How’s a guy supposed to know if he’s a “good guy” or not? And if he makes a mighty sacrifice for the cause of justice, it might not make any observable difference-in fact, it might only make things worse. And when Sullivan discovers that there’s an equal and opposite bit of stealth going on in Costello’s team, the game is afoot. Which mole will expose the other? Whose cover will be blown? It’s hard to guess, but we know one thing: it’s going to end in blood. It’s not Shakespeare, but it is a fantastically entertaining crime thriller, crackling with energy from beginning to end. 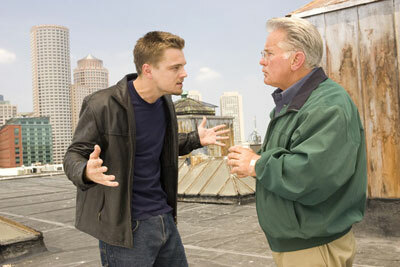 The Departed is a film of superior craftsmanship, with dialogue as jarring and relentless as the gunfire, cinematography that takes us on a tour of a shadowy underworld, editing that winds up the tension to almost unbearable levels, and some of the year’s most compelling performances. As Costigan, DiCaprio delivers his most performance since his legend-making turn in What’s Eating Gilbert Grape? He’s matched pace for pace by Damon, who continues his unbroken string of impressive performances. Mark Wahlberg, in a supporting role, manages to make an equally memorable impression. With so many talented actors working at the top of their game, Scorsese ends up with the most memorably compelling drama he’s made since 1995’s Casino. But the film falls short of greatness on several counts. First, Jack Nicholson’s outrageous over-acting becomes a distraction. What could have been character development looks more like Oscar-begging; what could have been a complex and fascinating study of the criminal mind is instead, well … Jack. Second, the film’s only prominent female character — a sophisticated psychiatrist named Madolyn (Vera Farmiga) – is implausibly reckless and unprofessional. The film celebrates her lamentable errors in judgment as she tumbles into bed with two of her troubled patients. While Farmiga is a charming screen presence, her character is the film’s weakest link. And finally, Scorsese fails to give proper attention to the most admirable character of the bunch. Martin Sheen plays Oliver Queenan, the chief of the Boston Police Department, and a Catholic. In the film’s spectrum of characters caught in varying compromises, he represents the film’s most upright and principled man. And yet, Queenan is all but ignored, so minor that reviews in The New York Times and The New Yorker don’t even mention him. He gets lost in the chaos of bullets and double-crossings. It’s a shame that Scorsese, in expanding on Infernal Affairs, is so much more interested in embellishing his characters’ sordid behavior than he is in examining marks of virtue and principle. The film that inspired him was so much leaner, and directors Andy Lau and kept us focused on the two principal characters. It feels like Scorsese’s a bit giddy with the excitement of finding wickedness under every rock, and while that makes for a bigger, more involving film, it doesn’t lend any greater resonance to the central narrative. This may cause concern for anyone anticipating his next film — an adaptation of Shusaku Endo’s Silence, that magnificent and harrowing novel about a Christian missionary whose faith is put to the test. The project gives Scorsese the richest, most profound source material he’s ever had to work with. Let’s hope that he finds himself more inspired by the passion of the missionary than by the malevolence of the devils who try to discourage him.